Only a few things elicit simultaneous sharing between my teenage daughter Misha and me. There’s new music, like when Chance the Rapper’s recent Coloring Book dropped. And there’s sports news, like when Duke University confirmed commitments from then-prep sensations such as Jahlil Okafor and Brandon Ingram and Harry Giles, and she, as a Duke fan, became accustomed to Duke Athletics always having a top recruiting class — and the possibility that some of those players might end up in one of my classes. And such was the case in March 2015 when three black women — Simone Manuel, Lia Neal (both from Stanford University) and Natalie Hinds (University of Florida) made history by finishing in the top three in the 100 freestyle at the NCAA Swimming Championships. Swimming is very white. Only 1 percent of the athletes who reported to a 2014 survey from USA Swimming identified as black. Misha was then a junior in high school, a competitive swimmer, and already thinking about her future as a collegiate swimmer. Her dream was to succeed at the highest levels of competitive swimming — always clear that she wanted to swim for a Division 1 program — where you might be hard-pressed to find more than three black bodies on the deck at any one time. Almost 30 years ago, Al Campanis, who was then the general manager of the Los Angeles Dodgers, suggested that black folk didn’t possess the “buoyancy” to succeed in swimming, as corollary to a larger point he was making about the lack of black baseball managers. It was a story I told my daughter in 2008 after Cullen Jones won a gold medal in the 2008 Olympics as part of the 4-x-100 freestyle relay. She shrugged it off at the time. My wife, who never learned to swim, wanted our daughters to learn. This was not just some idle black middle-class aspiration. Now, Manuel and Neal are representing the United States at the 2016 Summer Olympics in Rio de Janeiro. This is the first time two black women have made the swim team — and my daughter Misha is preparing for her first year of swimming — 50-yard and 100-yard freestyle, and the 100-yard butterfly — for the University of Illinois at Chicago Flames. I couldn’t have imagined caring about any of this — or needing to — when we adopted our oldest daughter almost 18 years ago. I still remember the deep feelings of anxiety, fear, and finally pride, watching my then-5-year-old daughter dive into and swim across the deep end — 12 feet — of the swimming pool. We were living in Austin, Texas. My wife, who never learned to swim, wanted to our daughters to learn. This was not just some idle black middle-class aspiration. The drowning rates for black and Latino youths are far higher than their white peers. Teaching a black child to swim is as important as any number of the “kits” we prepare for our children’s survival on a daily basis, such as how to react to law enforcement, never taking candy from strangers (which seems quaint in comparison) and always being hyperaware of your surroundings. Olympian Cullen Jones poses for a photo with Misha Neal in 2008. When we moved to the North Carolina Triangle region in 2004, we enrolled both our daughters in the swimming program at the local YMCA — the national organization is one of the largest facilitators of swim safety and competitive swimming. My oldest daughter was just sharpening her skills when a coach spotted her and asked if we’d ever thought about competitive swimming. Really? No. We’d no idea about proper equipment. Or the significance of warm-up, when swimmers swim nonstop for like a half-hour before meets. Or even the hieroglyphics that other parents write on their swimmer’s forearm (with the required Sharpie) to keep track of the event number, heat number and lane assignment. Playing right into cliché, we watched Pride — the 2007 film starring Terrence Howard about swim coach Jim Ellis — the night before Misha’s first official meet, hoping to get some clues. There were not a whole bunch of other parents offering advice. We did know that our daughter was not just athletic, but an athlete. There is a difference. She was going to be reasonably successful in any sport that allowed her to use her long, lean (though not always graceful) limbs. She took to water like Fela’s 1975 Water No Get Enemy had been bumping in the background of her whole life. When faced at the age of 9 with having to make a choice between the pool or the track, she chose — seemingly without any moment of reflection — swimming. Her decision, which we gave her ample room to make — her mother really wanted her to swim, and I was a track guy — set in motion a series of circumstances unimaginable. #BlackGirlMagic ain’t never played well with chlorine. We are talking about Black Girls and swimming — and for all the success of the black women swimmers mentioned above — #BlackGirlMagic ain’t never played well with chlorine. Hair matters is a point that was made early in my daughter’s swim career. Her hair decisions were bound by anxieties about how Black Girlness should be projected in the world, especially in the South, where a press ‘n’ curl has been the default for like a century. My daughter dismissed concerns about how other black folk might think about her hair and opted to go natural. At 10, she loc-ed up like her mother, but by her teen years went with an unprocessed bun — because she didn’t have no time to be sitting up in nobody’s chair for hours, regardless of the hair texture. So we knew we were in this swim thing for the long haul. We went all-in. And all-in for our family meant summer swim leagues, four years of high school swimming (November to February), and also a year-round swim team. My daughter practiced six days a week for 10 1/2 months from early September until early August of the next year, for eight years at The YMCA of the Triangle (YOTA) — including two-a-days during the summer. All-in meant more than enough three-day and four-day meets, sometimes missing school, giving up whole weekends, sitting through prelims, and if we were lucky, returning that evening for a second swim at finals, and the chance to score points for the team. All-in meant trying to get to the Triangle Aquatic Center or the Greensboro Aquatic Center early enough to get prime seats, or the spot close to the electrical outlet, so that my wife and I could get some work in during the five hours you’re at the pool, to watch, on average, about seven or eight minutes of your child swimming. Indeed, one of the reasons that we encouraged our younger daughter to also swim competitively (she is four years younger) was so that we could keep them both busy at the same time — and both my wife and I could attend meets. The pool helped us teach them about the importance of determination, and dare I say, pride. All in meant year-round swimming — the most important part of my daughter’s development as a swimmer. Meant thousands of dollars spent on team membership, on flight and car travel to meets in Florida and Indianapolis where the YMCA National Championships are held, and swim gear — a tech suit that might get worn two or three times a year at championship meets can cost more than $400. And the time commitment. That was a whole other thing. We knew we were in for it when we mindlessly planned a summer vacation to Savannah in the middle of the Long Course season. The Long Course is when swimmers compete in Olympic-style 50-meter pools — most summer leagues and high school teams swim the shorter 50-yard length. My daughter’s coach had to arrange practice time for her with a year-round team in Savannah, Georgia, because she couldn’t miss a week of practice during the middle of the season. Until my daughter learned to drive, we paid college students to drive her to and from her three-hour daily practices (30 minutes away in Raleigh, North Carolina). The car note for my daughter’s first car was cheaper than what we paid those college students. Even as middle-class parents, my wife and I had to re-evaluate our own priorities because of both the financial and social costs of the sport. It was a reminder that the lack of diversity in the sport has little to do with skill, passion or commitment, but access to both personal and institutional resources. Even as middle-class parents, my wife and I had to re-evaluate our own priorities because of both the financial and social costs of the sport — without always knowing whether our oldest daughter would sustain her own commitment as the teen years emerged and she had to make choices about sacrificing time with friends, or to simply be a teenager who attended school football games and Friday night dances. Go to any summer swim league in America in a moderately diverse metropolis and you will see your share of young black swimmers. But the more competitive the swimming, the whiter the sport gets. At some of the larger meets, where there might be more than 300 swimmers competing, it was nice that we could easily zero in on our kid with our eyes. There was also always and often that white parent who sidled up to tell us how beautiful Misha’s stroke is — she is a freestyle and butterfly sprinter. This comment is akin to “your daughter is so articulate” in swimspeak. What underlies this comment is the belief that black swimmers are great athletes in the sprints, but that they lack the technical skills to be really successful in the other swim strokes. And I’m not gonna lie, my daughter was and is often swimming against kids whose own parents were competitive swimmers (I can get from one side of the pool to the other … slowly), and who, unlike us, employed private stroke and diving coaches. My daughter was always ambivalent about the racial piece, never wanting to make a big deal about being the Black Girl In The Pool. A child with the ability to make middle-class white folk comfortable around her (because she is articulate), she didn’t like bringing attention to herself beyond what she did in the pool. She often felt squeezed, like so many high-functioning black students entering predominantly white educational spaces: not wanting to be thought of as only being on campus because of some set-aside program (though she still had to do the work in the pool), yet not wanting to be dismissed by coaches or college recruiters, who didn’t think she had — how shall I say this — the right pedigree. 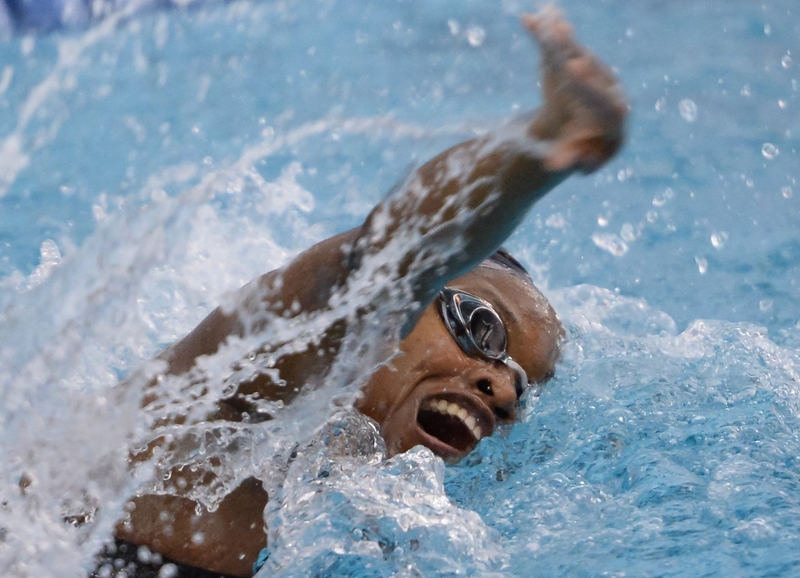 For several years Misha competed at the National Black Heritage Meet, the nation’s largest gathering of black swimmers between ages 8 and 18. Organized in recent years by North Carolina Aquablazers Swim Team, it’s held every Memorial Day weekend — and if you ever get the chance to attend, it feels like historically black college football broke out at the swimming pool. She always reacted strongly to what she perceived as the forced nature of the event, sensing that there should something more organic about black swimmers coming together, and somewhat embarrassed about explaining the significance of the meet to her white peers. She was also not crazy about the lack of spectator decorum, though that might just be on her — I dug the fish fry outside the aquatic center. My youngest daughter thoroughly enjoyed swimming at the Black Heritage Meets because the stakes were different for her. She was about the sheer fun of it, having given up the pool for softball. We already knew that our daughter was not just athletic, but an athlete. There is a difference. Misha’s presence in the pool matters. It matters to white parents alarmed that their daughter lost to a black girl, and a black girl from Durham, at that. Durham is a historically black city, which many in the Triangle region view as a ghetto to Raleigh or the more upscale Chapel Hill. 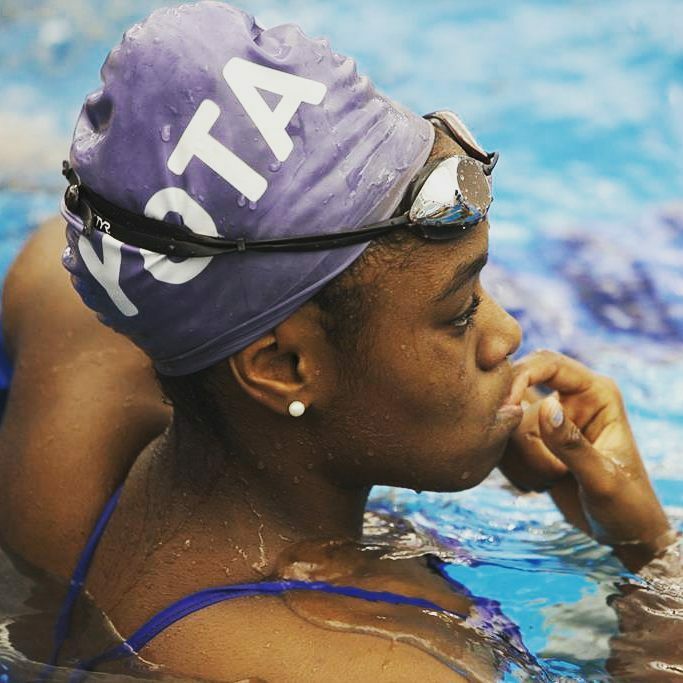 It matters to black parents who want their young daughters and sons to watch my daughter swim. When my daughter wants to fall back and just be a another swimmer, I remind her of the time, when she was 11 or 12, that a black mother asked me if she could introduce her 7-year-old daughter to mine. For that mother it mattered that her daughter met someone who looked like her to emulate, both in the water and outside of it. Misha Neal of Durham School of the Arts swims in the Women’s 100 Yard Freestyle race during the NCHSAA 1A/2A State Swimming Finals in Cary, N.C. on Friday, February 13, 2015. The reality is that my daughter finds herself being the role model that she didn’t necessarily have as a swimmer. Lia Neal was one figure, not simply because they share a surname, but because she was one of the youngest to ever qualify for the Olympic trials at age 13 in 2008. Our Misha also benefited from two older teammates, one an African-American swimmer and the other of Asian descent, who took her under their wings. As my daughter came to the end of her high school career, she began to do the same for some of the younger swimmers in her orbit, finally believing perhaps that she had something of value to offer both in and out of the pool. My daughter, who is good enough to swim Division 1 NCAA, and might be able to make an Olympic trial cut in four years (no pressure), was rarely the top swimmer in the pool, but what many of the black parents see (and even some of the white ones), is a swimmer who knows she has the right to be in the pool and to compete at the highest levels. Even as some of her coaches doubted her development, even as close friends who Misha began the sport with gave it up, even as naysayers told her how much she was missing out on by devoting so much time to the sport, Misha knew the pool was hers to claim. I suspect there were conversations that she heard about black swimmers, if not herself, that she chose not to share with her parents, but that she internalized as her own motivation. I still remember the deep feelings of anxiety, fear, and finally pride, watching my then-5-year-old daughter dive into and swim across the deep end — 12 feet — of the swimming pool. And given the history of blacks being denied access to public pool facilities this is a big deal. What is also a big deal is the way that my daughter’s confidence in the pool extends to the way she walks in the world. The sport of swimming has taught her the value of discipline, practice, planning and strategic thinking. For my wife and me, our daughter’s success in the pool has reaffirmed the importance of encouraging our children to think beyond the status quo — to see themselves in ways that even we cannot imagine, in ways that our own parents couldn’t have imagined in us. And yet my favorite swim story is not of our soon-to-be collegiate swimmer, but about her younger sister, who also swam competitively for three years. As my daughter Camille, who was then 9, played around in the pool at the Durham YMCA, a group of teenage girls asked her if she could swim across to the deep end, in disbelief that she could … ’cause black people don’t swim. Mark Anthony Neal is the author of several books including Looking for Leroy: Illegible Black Masculinities and New Black Man. He is Professor of African American Studies and English at Duke University. His daughter Misha Neal will swim this fall for the University of Illinois at Chicago Flames, where she will major in Art History.